For frying with all kinds of food or eat with hot rice etc. Ingredients: Onion (28.5%), Crab Meat (18%), Water (17.5%), Garlic, Soya Bean Oil, Peanut, Lemongrass, Chilli, Sugar, Salt, Thickener (E1422), Flavour Enhancer (E621), Colour (E160c). 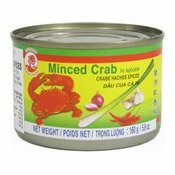 Simply enter your details below and we will send you an e-mail when “Minced Crab In Spices (Dau Cua Ca Ri) (蟹肉香料)” is back in stock!